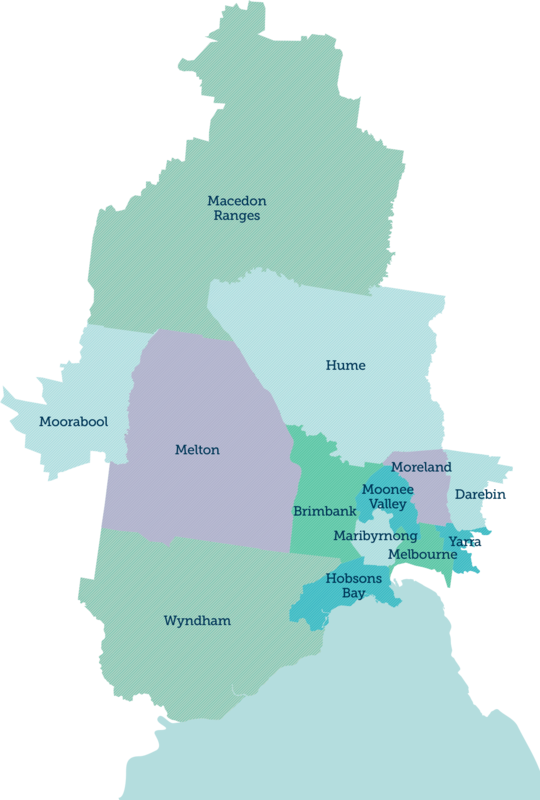 Our PHN is one of the most diverse and complex regions in Victoria. Our community includes an estimated resident population of 1,535,433 and thousands of primary health care providers working across over 520 practices, 12 community health services, 12 major hospitals and 15 private overnight hospitals, 375 pharmacies and 3 super-clinics, over 120 mental health and alcohol and drug service providers, and over 140 aged care facilities. Find out more about the local services in our region. View the latest health data on our region. North Western Melbourne PHN covers one of the largest and most diverse regions in Victoria. Our region stretches from coastal Cocoroc in the south, to the regional areas around Lancefield in the north, and as far west as Bacchus Marsh. Our health community is equally as diverse, with a multitude of services, providers, health organisations and distinct communities each forming a part of many overlapping local health systems. One of our key goals as a PHN is to identify the key health needs and issues within our community. We do this through a collaborative regional Health Needs Assessment process every two years, as well as various targeted health needs planning, research and engagement activities. Together these processes build a shared understanding of health priorities and a common agenda for action in our region.